Norfolk Police Commissioner under fire! Listen! Do you want to know a secret? As you drive into the village of Stiffkey on the A149 coast road you will immediately notice one thing; the road is extremely narrow and is lined on both sides by brick and flint walls. In the height of the summer tourist season this can create a traffic jam as vehicles try to escape the confines of Stiffkey, making for the shining uplands of Wells in one direction or Morston in the other. Stiffkey is in a narrow valley created by the river of the same name, which I would imagine at one time in the distant past was much more impressive than it is now. The river is bridged just into the Langham road and the river with its little confining valley is quite attractive during the summer months. The river flows through the village eventually making its way to the sea at Stiffkey Freshes. 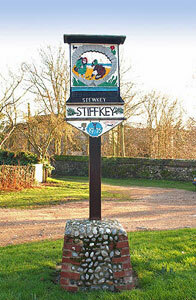 If you would like to know more about Stiffkey’s history there is a wealth of information available. Pevsner’s The Buildings of England makes particular note of Stiffkey Old Hall, which is close to the church. Building began in 1576 and what remains of the original structure is still impressive. The nearby rectory was infamous during the 1930’s due to the activities of the incumbent Harold Francis Davidson. His neglect of his parish work, his family and his frequent trips to London to carry out his work as the so called “Prostitutes’ Padre” started local tongues wagging. In 1932 he was defrocked by the Church after being convicted by a Consistory Court in Norwich on immorality charges. Davidson went on to make a new career as a performer to raise funds for an appeal. He even went to the lengths of sitting in a barrel on the seafront at Blackpool. Davidson finally met his demise at Skegness when he was killed by a lion after he entered its cage, as a kind of action replay of Daniel in the lion’s den. Sadly Davidson did not fare as well as Daniel. Davidson still had many friends and they provided the funds for his funeral at Stiffkey. The church and the churchyard were packed with people and estimates at the time numbered the crowd at 3000+. The Marquess and Marchioness Townshend, from their stately seat at Raynham Hall near Fakenham, were among the mourners. In modern times Davidson has come to be regarded as a victim of an antiquated church legal system and his reputation has to some extent been restored. 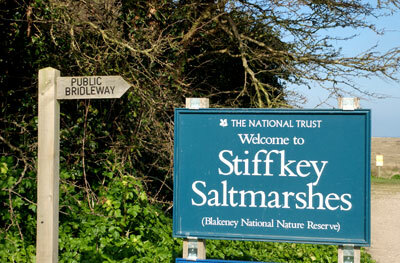 At the northern end of the village is a long concrete road called Green Way that leads down to Stiffkey saltmarshes. It was laid by the army, as until the 60’s there was an army camp at the end of the road. The camp was used for training anti-aircraft gunners. The site is now used as a camping site and the original guardroom is still in use by the campsite owners. There is a rough car park area at the edge of the marsh (on the Norfolk Coastal Path) belonging to the National Trust. The marshes are cared for by the Trust and full details are available here. If you walk along the track that crosses the marsh you will eventually reach the sands (20 minutes +). Visiting at low water will enable you to dig for the famous Stewkey Blues. These fat cockles are given the name because the shells do have a blue colouration. To be successful I suggest you take a garden rake and a pail. Pulling the surface of the sand away with the tines of the rake should reveal the buried cockles. If you are lucky and collect enough to cook, treat them as you would mussels. They are absolutely delicious. The East Anglian Film Archive has an interesting documentary in its library relating to Stiffkey Marshes. It was made many years ago but is definitely worth viewing. Parking in Stiffkey is very limited. The above mentioned National Trust car park is a long way from the village itself. There is a small parking area near the village sign at the Morston end of the village and limited on-road parking at Langham Road. The village has a general store that contains a Post Office counter. There is also an antique shop in the village centre that is worth a browse around. For food and drink, the Red Lion at the northern end of the village has a good reputation, although I have as yet not eaten there. A situation I must address this coming summer. A lot of good information well done. I don’t have personal knowledge of this but it might be worth trying an email to Di Dann the Stiffkey Parish Clerk at didann@outlook.com. She probably won’t know herself but she will have contacts that might. I came across your website while looking for information about an artist. Would you happen to have any information about the artist, or be able to tell me where I might find out more?